November 2014-Liliana needed an adaptive tricycle with torso supports. 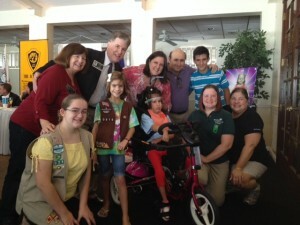 Wheelchairs 4 Kids along with the JCI Senate, Hollywood Jaycees and Girl Scouts were able to get her exactly what she needed from Rifton. Now Lily can use her new bike to exercise and increase her stamina, mobility and muscular strength. She will also be able to join her family and friends when they ride bikes and have fun outdoors and explore more of her world! 10 year-old Liliana is very outgoing despite her numerous challenges. She was diagnosed with Cerebral Palsy and developmental delay. Liliana’s limitations include an inability to support her head and torso. She also cannot walk or verbally communicate. Do any of these hindrances slow Liliana down? Not one bit! Liliana finds pleasure in many things. She enjoys going to the pool and sitting under the warm Florida sunshine. Liliana gets excited watching her brother play soccer. Liliana is very social, too. She is active in Girl Scouts and she loves her troop of friends! Furthermore she keeps busy with home bound school. Learning is one of Liliana’s favorite activities. She learns about the world in her most beloved book, The Encyclopedia of Knowledge.